From August 1982: An ad for the Airfix DUKES OF HAZZARD model kit range. 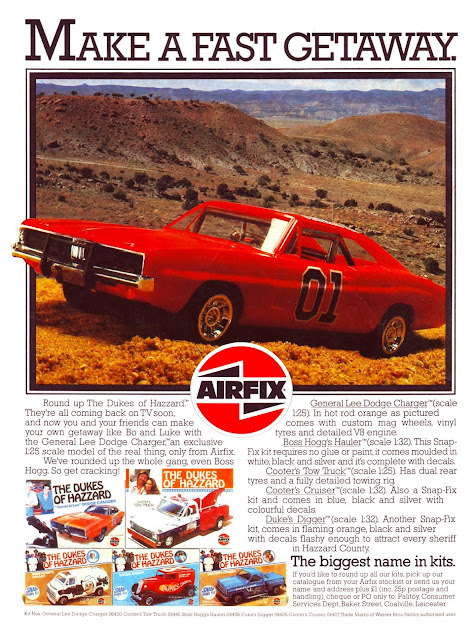 In light of recent tragic events in Charleston, and the backlash against the Confederate flag, the Warner Brothers licensing folk have announced that future toys and paraphernalia featuring the General Lee will appear without the flag adorning the Dodge Charger's roof. Result: Instant price hike for everything produced in the past thirty-odd years. I thought it would be interesting to unearth this British print ad from 1982 which features the General but, deliberately or otherwise, doesn't make much of the flag. I think it's safe to say that most people in this country - especially kids at the time - made no connection between the flag and anything more controversial. Indeed, it's hard to think of a TV show that's more innocuous. I was out in the States last year and, on one of the cable channels, the show was still being rerun in primetime. And, much like THE A-TEAM, KNIGHT RIDER and other shows of the time, rewatching episodes now (I picked an episode, pretty much at random, last night) feel like a return to a more innocent time. It's also now far easier to appreciate their relative strengths rather than just slavishly follow the mantra that they must be poo because everyone says they are. There's also this really well done US TV spot that reunites some of the original cast... and succinctly boils down the appeal of seven years of episodes into a couple of minutes. But... where are Coy and Vance?